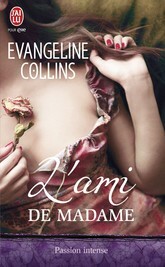 Evangeline Collins is an author of historical romances set during the Regency. With a nod to the unconventional and with a hint of a dark edge, she blends passion, elegance and lush details to create irresistible romances. Seven Nights To Forever has been named the Most Innovative Historical Romance in RT Book Reviews 2010 Reviewers' Choice Best Book Awards! Her Ladyship's Companion is now available in mass market format! Check out Seven Nights To Forever's book page for a sneak peak at Chapter Two. Foreign Language rights for Seven Nights To Forever have been sold to France, Japan, Turkey, Russia and Spain. Foreign Language rights for Her Ladyship's Companion have been sold to France, Italy, Russia and Spain. Want to be notified about new book releases? All content copyright © EvangelineCollins.com. All rights reserved.